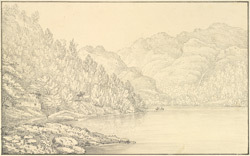 Sketch of the western shore of Loch Lomond, in Scotland, between the areas of Tarbet and Luss. The loch is one of the largest in Scotland and the wild and picturesque landscape surrounding it has long been an inspiration to artists, poets and writers. The village of Luss has historically been the home of the Colquhoun family and interestingly it was originally known as Clachan Dubh – which translates as ‘the dark village’. Tarbet was described by Queen Victoria as, “ …a small town… with splendid passes, richly wooded and the highest mountains rising behind”.